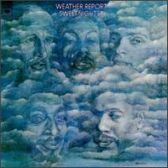 Right from the start, a vastly different Weather Report emerges here, one that reflects co-leader Joe Zawinul's developing obsession with the groove. It is the groove that rules this mesmerizing album, leading off with the irresistible 3/4 marathon deceptively tagged as the "Boogie Woogie Waltz" and proceeding through a variety of Latin-grounded hip-shakers. It is a record of discovery for Zawinul, who augments his Rhodes electric piano with a funky wah-wah pedal, unveils the ARP synthesizer as a melodic instrument and sound-effects device, and often coasts along on one chord. The once fiery Wayne Shorter has been tamed, for he now contributes mostly sustained ethereal tunes on soprano sax, his tone sometimes doubled for a pleasing octave effect. The wane of freewheeling ensemble interplay is more than offset by the big increase in rhythmic push; bassist Miroslav Vitous, drummer Eric Gravatt, and percussionist Dom Um Romao are now cogs in one of jazz's great swinging machines.